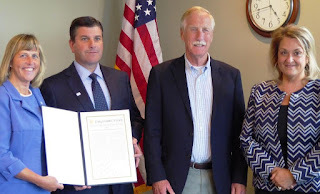 In a small ceremony held in Bar Harbor on the afternoon of August 30, United States Senator Angus King presented Bar Harbor Bank & Trust with a Congressional Record commemorating the 130th anniversary of the Bank. Curtis Simard, Bar Harbor Bank & Trust President and CEO, was there to accept the recognition along with other Officers of the company. Earlier this year Bar Harbor Bank & Trust completed their acquisition of Lake Sunapee Bank, doubling the size of the company. This leading Northern New England community bank is headquartered in Bar Harbor, on Mount Desert Island, in Hancock County, Maine. Since the merger the Bank continues to post strong growth and earnings. Now in its 130th year, Bar Harbor Bank & Trust is an employer of choice for local residents and has also attracted talent from out of state. With an already great reputation, Bar Harbor Bank & Trust’s recent acquisition shows their commitment to remaining independent, competitive and profitable, while maintaining their community bank feel and culture. 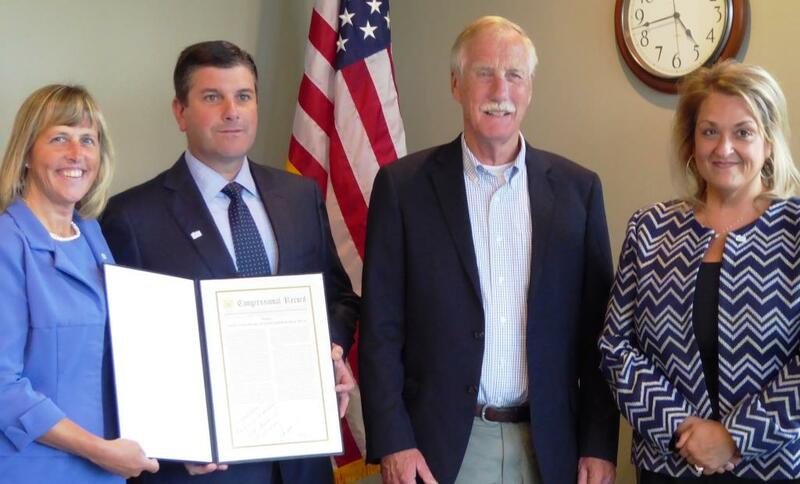 Senator Angus King (second from right) presented Bar Harbor Bank & Trust with a Congressional Record commemorating the 130thanniversary of the Bank. Bank Officers left to right include Lisa Parsons, SVP, Regional Market Manager; Curtis Simard, President & CEO; and Josephine Iannelli, EVP/CFO & Treasurer (far right).